Built between 1955 and 1957, the former B.C. 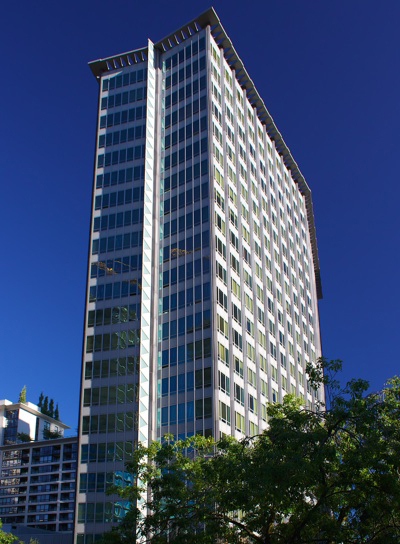 Electric/Hydro Building is one of the most striking buildings of the post-war building boom in British Columbia. Designed by well-known architects Ronald Thom and Ned Pratt of the pre-eminent local firm Thompson, Berwick and Pratt; this building is a choice example of West Coast modern architecture and was selected as a Recent Landmark of class “A” merit to be added to the Vancouver Heritage Register. Dal Grauer, B.C. Electric’s president at the time, is said to have worked closely with the architects in the design of the building. One of his criteria was that all employees working in the building’s offices had to be within 15′ (4.5m) of a window: this requirement evolved into the shallow-depth design. As part of a Canada Centennial project, BC Hydro commissioned Robert Swanson – an engineer and sound specialist – to build air horns that played the first four chords of “O Canada”. The 10-cast aluminum horns – representing each of the Canadian provinces – were fitted at the top of the building and played daily at noon from 1967 until 1990 when the building was vacated by BC Hydro. In 1994 the horns were relocated to Canada Place. To this day the 12 o’clock horns are heard throughout the downtown area. In the early 1990s, the building was converted into 242 residential units and 205 commercial units comprising street-level retail and executive offices. This revitalization reflected the relatively new cultural appreciation of the modern ’50s style.